I just love your name, Twigs. You are beautiful, no wonder it was love at first sight. What a beautiful Budgie boy you are, Twigs! Your coloring is exquisite, simply breathtaking! Your human describes it so much better than I can! I walked over to the budgie cage and saw the most beautiful budgie I've ever seen! His colors really caught my eye. He is a mutation called recessive pied, and happens to be a goldenface. His patches of both bright and light yellow with a turquoise belly was such a stunning color that he had me mesmerized! Your physical beauty truly is mesmerizing, Twigs! But as your beautiful as you are in looks, it's your sweet and gentle personality that makes you the extra special boy that you are; reading a bit about how you and your mommy came to be that touched me most of all! What a wonderful addition to the flock you were, Twigs! Best Christmas gift ever! And while it broke my heart to hear of the untimely passing of your dear friend, Pix, I was comforted reading how you made new feathered friends, spending evening time visiting with the parrot pals, playing with their toys and snitching their food! And what a good boy, dutifully heading back to your house when your mommy calls "bedtime!" Oh, what a treasure you are, Twigs, precious beyond words! Your family is so very lucky, having a feathered family member as beautiful, as gentle and loving as you! You're a gem, just as special as they come, and so very deserving of your big day of honor! Thanks for the BIG smiles, sweetheart! Meeting you today, seeing your beautiful photos, has been a real treat! I hope you're enjoying a very special day of celebration...flying about your room, visiting with your feathered friends, being loved and pampered to pieces! Lots of love to you, precious Twigs, our very special and most deserving Pet of the Day, EVERY day! Dearest Twigs, what a beautiful budgie you are! Those colorful feathers are absolutely gorgeous, and you have the sweetest face with those big dark eyes! And what a wonderful story you have to tell! Your dear mom-to-be saw you in the store one day. She'd never had a budgie before but was mesmerized by your stunning colors. She and dad-to-be came back later and got you and the mostly-white budgie Pix. You two became best friends, but we're sorry to learn Pix passed away after a year. Now you live in a room with several parrots! You come out for supervised playtime with them each evening. You are such a good boy, and you and your dear parents all love each other very much, don't you. What a delightful love-filled home you share! 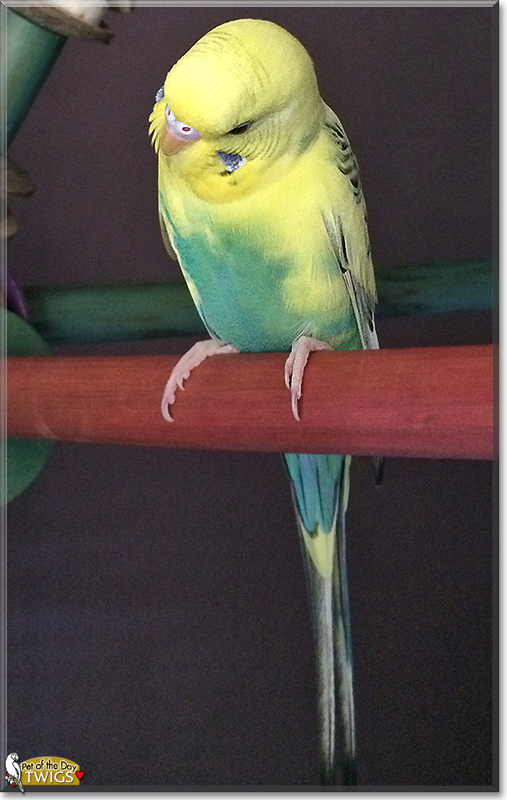 Congratulations, darling Twigs, on being chosen today's Pet of the Day! We know you and your dear parents and parrot pals and all your family and friends are enjoying a fine celebration, full of fun and lovies and all your favorite games and treats. We know Pix Angel is rejoicing with you at the Rainbow Bridge! Congratulations on being POTD beautiful Twigs!